I recently turned my design skills to something other than web sites. 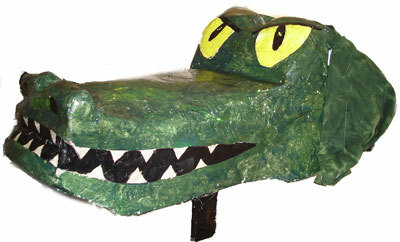 It was an interesting project, the creative brief was to construct a crocodile costume for 4 dancers. The costume will be used in the production of Peter Pan by Wildwood Dance and Arts. Here is the head (made of sculpture wire and pacier mache) which will be held by the lead dancer, the three other dancers will be draped in fabric and the 4th dancer has a tail.